Okay, book three of the Haruhi Suzumiya series is... umm, well, in the books. Like the previous two books in the series there was a prologue, an afterword by the author, a few illustrations in the book by Ito Noizi scattered throughout, and a couple of manga pages at the end of the book. However, what makes this particular entry in the world of Haruhi different than its predecessors is that it's actually a collection of four short stories that take place between books one and two. Each story takes place chronologically so you don't have to worry about which story to read first, but if reading this book after book two bothers you then I suppose you can switch the order. However, a lot of the books skip around like the anime and just like the anime I don't recommend skipping around because you could spoil things for yourself. And skipping the short stories just because they are shorts isn't recommended at all. The Boredom of Haruhi Suzumiya - Taking place immediately after the first book, Kyon is desperately trying to forget the event that took place in closed space while Haruhi decides that the SOS Brigade is going to enter a baseball tournament that begins in two days. Never mind that none of them are exactly baseball experts because that apparently isn't important; Haruhi gets what she wants and what she wants is to compete in the tournament. To make matters worse, Haruhi really wants to win and that's not something Kyon thinks they have a chance at doing. He even goes so far as to make his little sister a team member just so they can lose quicker and be done with the whole thing. Once they are down 9-0 things seem to be going Kyon's way. But is Haruhi's frustration with her team's lack of enthusiasm (and skill) going to cause the world to end? Well, Kyon really doesn't want to have to do what he did last time so he decides something has got to happen to get them back in the game. Is there any chance they can make a miraculous comeback that will soothe Haruhi's melancholy? This story was adapted into episode four of the first season of the anime. If you really want your mind blown then listen to this: the title story for this collection was published independently a whole two months before book one was ever released. Nagaru says in the afterword that he was initially nervous about that development but everyone around him seemed to be all for it so he let it happen. Bamboo Leaf Rhapsody - This story is perhaps my favorite story in this collection. It's our first glimpse into Asahina's ability to time travel and it's the first time that Kyon seems to be more than just the ordinary human being he claims to be. In fact, this time around Kyon himself becomes a time traveler and meets up again with the adult Asahina that he initially met in the first book, but this time he meets her three years in the past. Yup. This story was adapted into episode one of the second season of the anime. 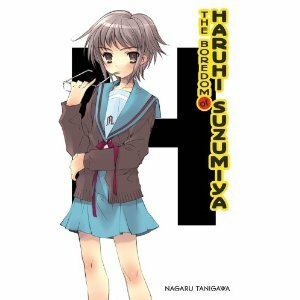 Book four in the series The Disappearance of Haruhi Suzumiya (as well as the movie) relies heavily on this story so pay attention. Mysterique Sign - One day the president of the computer club disappears and Haruhi decides to enlist the SOS Brigade to help find him. The storyline reminds me of one from The Melancholy of Haruhi Suzumiya where Haruhi and Kyon go searching for Asakura Ryoko, but the giant cave cricket that appears in the computer president's room make things a bit more interesting. This story was adapted into episode seven of season one of the anime. Remote Island Syndrome - Haruhi wants to go on a remote island adventure to start off their summer vacation in style. The conditions are that the island must indeed be very remote, there must be suspicious characters (such as a maid or a butler), and there must be some sort of mystery to solve. Thanks to Koizumi's distant relatives this remote island vacation actually become possible, but can there really be any mystery to solve? At first nothing interesting seems to happen. It's just R&R. As well as little bit of underage drinking. Then the owner of the villa on the island gets murdered and a hurricane prevents the police from coming for at least a day. This is the very scenario Haruhi had been wanting and waiting for. But is this all of Haruhi's doing because of her subconscious wish for something exciting to happen? Kyon doesn't seem to think so because Haruhi may in fact be a bit loony, but there's no way she could really want a murder to happen. Could she? This story is the longest one of the bunch. Closer to novella length, but not quite long enough to be a stand alone light novel. The story was adapted into episodes six and eight of the first season. This is the first time that I felt like the anime took a bit more free adapting with one of the Haruhi stories. The scene in the anime where Kyon gets trapped in a cave with Haruhi while trying to look for the boat off the island isn't in this story. I rather liked that scene because it provided some interesting character interaction. The ending is also different than the one in this story. Apparently, the anime borrowed its ending from the manga and not the light novel. Perhaps the biggest difference between the two is that Kyon's sister accompanies the SOS Brigade on its island adventure in the anime, but she doesn't in the light novel. Curious change. I think I might like the way the anime tells this story more. But the story is good, too. If a little bit too long. Anyway, there's the breakdown. I enjoyed the book. Especially Bamboo Leaf Rhapsody. If you are a fan then you can't go wrong with this one.